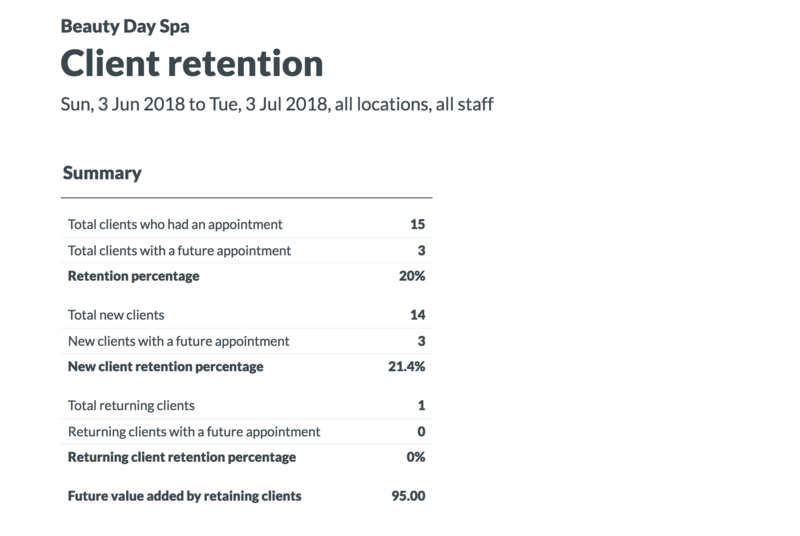 In the salon and spa industry, client retention is an important metric. In Timely, we have a number of tools and reports available, that help you to track and improve your client retention rates. Client retention reports in Timely. Timely tools for increasing client retention. Simply put, client retention measures whether or not clients are coming back to visit your business. Selling and marketing your products and services to your existing clients, is much more efficient and effective, than acquiring new clients. A client retention strategy should be an important part of your business plan. It will work alongside marketing initiatives for new clients, to help maintain and grow your business. In Timely, we will consider a client as "Retained" if they have a future booking in the calendar. New client retention: How many of your new clients are returning. Returning client retention: How many of your existing clients are returning. Total client retention: How many of your total clients (new and returning) are retained. There are a couple of reports that you can use in Timely, to measure your client retention rates. The client retention report gives you an overview of the retention rates across the entire business. This can be run for all staff, or for an individual staff member. This report will allow you to measure how many of your clients in a given date range have future bookings. This will give you a breakdown of how many of your total, new and returning clients have been rebooked. As well as showing you retention percentages for individual staff and services. 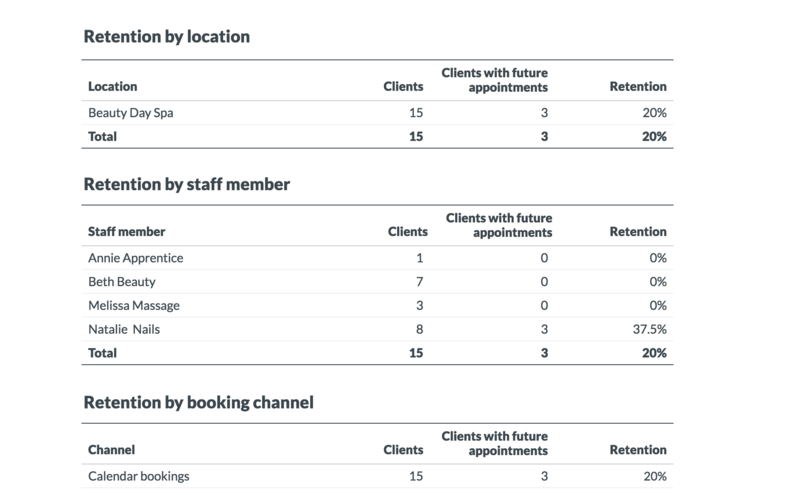 Note: The retention percentages will be based on a per client basis, not on individual bookings. So if a client visits multiple times within a specific date range, they will only be counted once. This report is currently in Preview and is based on new calculations. This means that the figures that you see in this report will be different to the retention/rebooking numbers in the Executive Summary. The main difference is that this is on a per client basis, versus a per appointment basis. This report allows you to view a list of customers that visited within a specific date range, that haven't been rebooked. This allows you to easily identify those customers so that you can reach out to them directly. We're always looking for ways that we can help support your business goals and client retention is an important part of that. Delivering a fantastic in salon experience is one part of the puzzle. We'd recommend checking out the following features and approaches, to give your client retention rates a boost. Reduce phone tag and back and forward conversations with Online booking: Getting started with Online bookings. Keep customers in the loop with Reminders and Notifications: How to send automated appointment reminders and booking confirmations and notifications. Deliver a professional and seamless front-counter experience with the Timely iPhone and iPad app: How to get the Timely iPhone or iPad app. Quickly Rebook clients for their next appointment, at the end of their appointment: How to rebook an appointment. Send them a thank you or ask them for feedback with our Follow up messages: How to send automated follow-up messages. Automatically send Rebooking reminders when they are due for their next appointment: How to send automated rebooking reminders.